The game's website can be found at www.MAngband.org and holds some useful documentation about the game, a forum and some live statistics. The game may have simple graphics, but the gameplay is good as any. 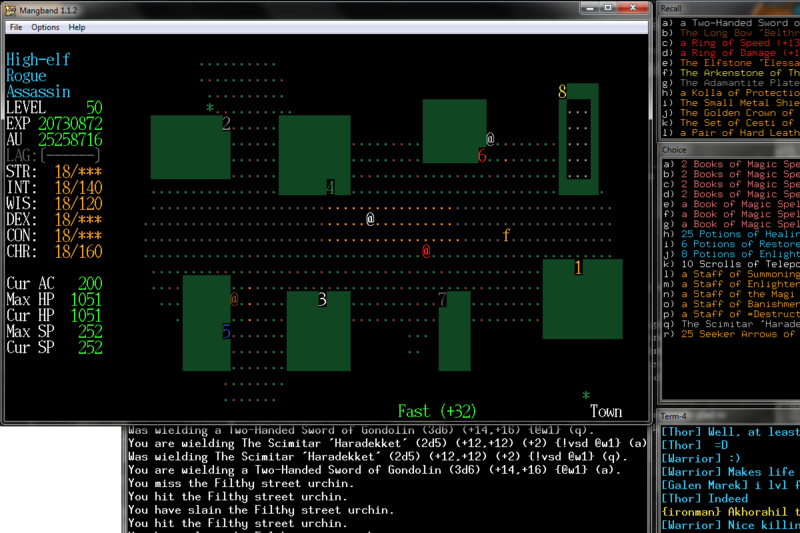 As with most roguelike games there is a great deal of commands to learn, but the real-time nature of a multiplayer game makes sure something is happening from the moment you learn how to walk. On your journey from your first auto-retaliate-kill to the final battle with Morgoth, The Lord of Darkness you will find that there is a near endless supply of content to explore, including both randomly generated and truly unique equipment. The same goes for monsters, where the kill of a particulary tricky monster will land you a global notification followed by congratulations from other players. Personally I find this game quite entertaining, and altho there are not very many active players, everyone there are mostly glad to help a fellow player in need. Of course, this game require some patience when you are new, and be prepared to die a few times before you get the hang of it.